was a German born, American Computer Scientist and Professor Emeritus from Carnegie Mellon University , Pittsburgh, Pennsylvania. Hans Berliner was Grandmaster of Correspondence Chess, International Master for over-the-board chess and was Correspondence Chess World Champion from 1965 until 1968. 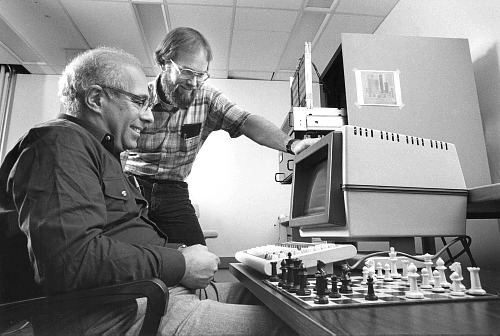 Hans Berliner made his Ph.D. Thesis in 1974 at Carnegie Mellon about computer chess: Chess as Problem Solving: The Development of a Tactics Analyser  under the supervision of Allen Newell. Berliner contributed as co-author to the Technology Chess Program. He was author of the chess programs J. Biit, CAPS, Patsoc, along with Murray Campbell co-author of the chunking pawn endgame program Chunker, and lead the team in developing the HiTech chess entity - namely Carl Ebeling, Murray Campbell, Gordon Goetsch and Chris McConnell. Beside other things, Hans Berliner's research was about pattern knowledge and creation and implementation of the best-first tree search algorithm called B* , also used in HiTech. In the late 70s at Carnegie Mellon University, Hans Berliner developed the Backgammon playing program BKG 9.8 for the PDP-10 to research the principles of evaluation for another game than chess with a much higher branching factor of more than 800 at every node . Early versions of BKG played badly even against weak players, but Berliner noticed that its critical mistakes were always at transitions apparently due to evaluation discontinuity. He applied principles of fuzzy logic to smooth out the transition between phases, and by July 1979, BKG 9.8 was strong enough to play against the ruling world champion Luigi Villa. It won the match 7–1, becoming the first computer program to defeat a world champion in any game. Berliner states that the victory was largely a matter of luck, as the computer received more favorable dice rolls  . Acknowledgements: I am indebted to Hans Berliner, World Correspondence Chess Champion, who developed the elegant techniques used in the positional analysis, and whose patient discussion helped to clarify many of the conceptional problems. The basic idea of the Technology Program is due in large part to Allen Newell. A number of experts were invited to give papers. on their work, including Dr Mikhail Donskoy of the USSR, one of the authors of the world champion program, KAISSA. Unfortunately Donskoy was unable to attend, a disappointment only mitigated by the presence from the US of Dr Hans Berliner, of Carnegie-Mellon. Berliner is the world correspondence chess champion and has also spent the last eight or nine years programming computers to play the game. To most people in the practical, model building side of the subject, ie making a program play the computer game, Berliner is THE expert. Although full of good, implementable ideas he has no illusions as to the limitations of such chess programs. The conference itself lasted one and a half days and the papers (depending on the listener) ranged from the profound to the puerile. I have no desire to repeat my own personal views, indeed as one of the organisers I helped to provide a platform for speakers whose views I found astonishing. What did seem evident to me was that the majority of the audience fell into one of three categories. One group is the artificial intelligentsia. They fully understand the difficulties of the problem and are still thinking about how to solve it. The second group are the let's get on and program something crunchers, the model makers, the people who can make big computers float round the room whistling God save the Queen. These people absolutely refuse to put anything remotely resembling knowledge, chess or otherwise, into their programs if they can avoid it, believing that if the result plays good chess then it can be more easily adapted to attempt other, more useful, decision making problems. The third group is the most important, these are the people who are new to the subject, the people who say, It sounds like a fascinating problem and I'd like to know what's going on. Hans Berliner fits into two of these categories, his talk covered the AI approach and the crunchers, but he is hardly a newcomer. He was the first speaker and the domain of his talk was chess tactics with emphasis on recognising situations and dealing with them explicitly. He is full of good ideas and techniques which are relevant to the problem of selecting the right move in a game of chess and, more important, showed clearly how each idea and technique could be implemented in a computer. I have been responsible for doing the pattern knowledge and most of the opening book, and acting as moderator for the many fine discussions that we have about how to improve HiTech in the various areas that need work. Hans Berliner (1970). 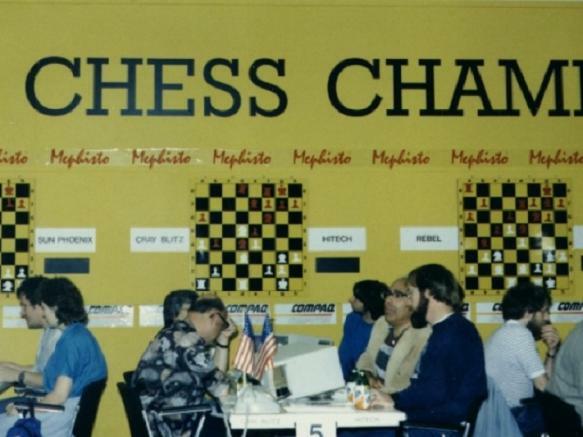 Experiences Gained in Constructing and Testing a Chess Program. IEEE Symposium System Science and Cybernetics, reprinted in David Levy (ed.) (1988). Computer Games I.
Hans Berliner (1977). BKG - A Program that Plays Backgammon. Technical Report, Carnegie Mellon University, reprinted in David Levy (ed.) (1988). Computer Games I.
Hans Berliner (1978). A Chronology of Computer Chess and its Literature. Artificial Intelligence, No. 10, pp. 201–214. Hans Berliner (1979). The B*-Tree Search Algorithm - A Best-First Proof Procedure. Artificial Intelligence, Vol. 12, No. 1, pp. 23-40. ISSN 0004-3702. Hans Berliner (1980). Backgammon Computer Program Beats World Champion. Artificial Intelligence, Vol. 14, hosted by Backgammon Galore, reprinted in David Levy (ed.) (1988). Computer Games I.
Hans Berliner (1984). Search vs. knowledge: An analysis from the domain of games. In A. Elithorn and R. Banerji (Eds. ), Artificial and Human Intelligence (pp. 105-117). New York, NY: Elsevier. Hans Berliner, Murray Campbell (1984). Using Chunking to Solve Chess Pawn Endgames. Artificial Intelligence, Vol. 23, No. 1, pp. 97-120. ISSN 0004-3702. Hans Berliner (1985). Goals, Plans, and Mechanisms: Non-symbolically in an Evaluation Surface. Presentation at Evolution, Games, and Learning, Center for Nonlinear Studies, Los Alamos National Laboratory, May 21. Hans Berliner, Carl Ebeling (1986). The SUPREM Architecture: a new Intelligent Paradigm. Artificial Intelligence, Vol. 28, No. 1, pp. 3-8. Hans Berliner, Carl Ebeling (1989). Pattern Knowledge and Search: The SUPREM Architecture. Artificial Intelligence, Vol. 38, No. 2, pp. 161-198. ISSN 0004-3702. Hans Berliner (1993). Losing the Human Edge. BYTE, May, p. 282. Hans Berliner, Chris McConnell (1996). B* probability based search. Artificial Intelligence, Vol. 86, No. 1 pp. 97-156. ISSN 0004-3702. This page was last edited on 2 January 2019, at 18:02.